FANTASY DONE NANCY HANSEN’S WAY- ‘THE SUDARNIAN CHRONICLES: FORGED BY FLAME’ DEBUTS! A noted publisher of Genre Fiction, Pro Se Productions built an imprint around noted New Pulp Fantasy Author Nancy Hansen. Known for intricate world building and fantastically realized characters, Hansen’s latest volume in the HANSEN’S WAY imprint, THE SUDARNIAN CHRONICLES: FORGED BY FLAME, is now available in print and digital formats. When death comes hurtling down from the heavens, the children of that settler group are orphaned. Rescued by Elves, they are held in custody until a trusted ally comes to collect them. Each finds an uneasy niche of sorts within Sudarnian society; but what will ultimately become of these three foundlings, and what part will their contributions play, in a land now facing a far more potent menace than it has seen in decades? All the answers lay within the hearts, minds, and spirits of a trio of children whose intertwined destinies were FORGED BY FLAME! By Nancy Hansen and from Pro Se Productions. 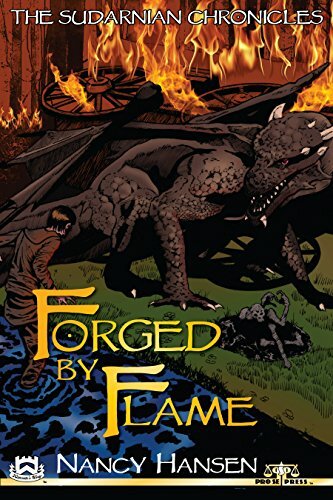 Featuring a fantastic cover by Rick Johnson and cover design and print formatting by Percival Constantine, THE SUDARNIAN CHRONICLES: FORGED BY FLAME is available now at Amazon at http://www.amazon.com/Sudarnian-Chronicles-Forged-Flame/dp/1530328365/ref=sr_1_1?s=books&ie=UTF8&qid=1457121832&sr=1-1 and Pro Se’s own store at www.prose-press.com for 15.00. The latest HANSEN’S WAY volume is also available as an Ebook, designed and formatted by Shannon Muir for only $2.99 for the Kindle at http://www.amazon.com/Forged-Flame-Chronicles-Nancy-Hansen-ebook/dp/B01CHBYK82/ref=sr_1_2?s=books&ie=UTF8&qid=1457121832&sr=1-2 and for most digital formats via Smashwords at https://www.smashwords.com/books/view/619978. A WEIRD HERO FROM THE PAST RETURNS! “THE LAST DOMINION: THE IRON SKULL” DEBUTS FROM PRO SE!